This shot I took while I was on a phone call with my friend Vivek. He had just returned home after watching the movie Interstellar and he got fascinated by it. I do not watch movies as such, probably 1 a year or maybe not even that, but his talks made sense and I believe, so did the movie. I do watch shows on discovery science like "Through the wormhole" by Morgan Freeman. I have a keen interest in outer space and the mysteries of the universe. I am a lazy photographer and I took this shot one handed with the camera raised above my head. That talk of the wormholes and life after death, well maybe this shot captured some essence of that. For me each Minimalist Photo has a hidden message in it. I am almost certain that this shot came straight out of my sub-conscious mind as my conscious mind was busy talking to my friend on the phone. The photo falls under the Parts of the Whole Minimalism category. This is the side portion of a green hut-shaped house. On the bottom right, the dark wall belongs to a house just near it. 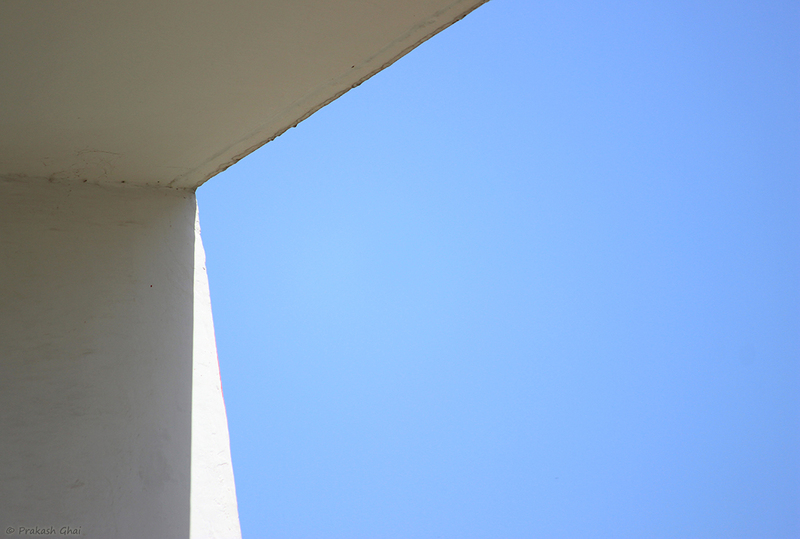 So I have taken two parts, of two houses plus a part of the blue sky in the background to compose this image. 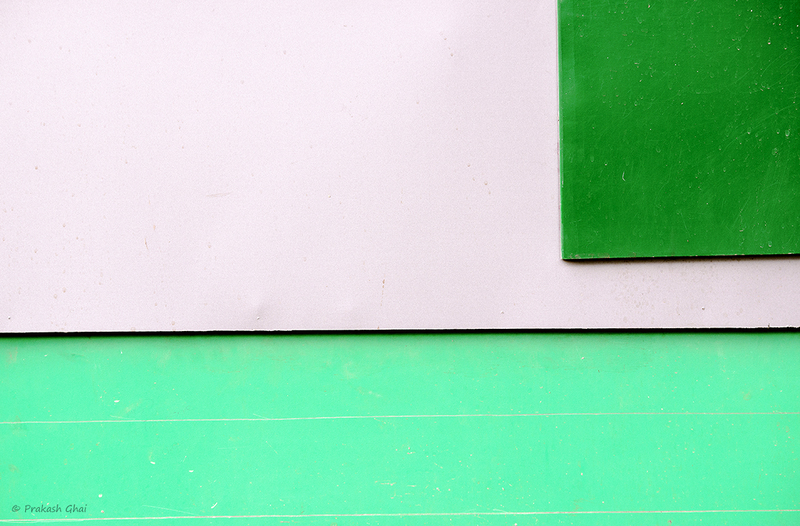 This explains why this Minimalist Photo is Minimalism as Parts of the Whole. The parts of the houses have been interpreted as lines going in various directions. The unique color palette enhances the overall composition. I have kept the focus point on the bottom right corner of the textured wall and cut it into a partial White Rectangle. I kept moving to my right to also get that contrasting Black Square in the background. The contrast between the two geometric shapes is shown to depict contrasting lives of two different people,. 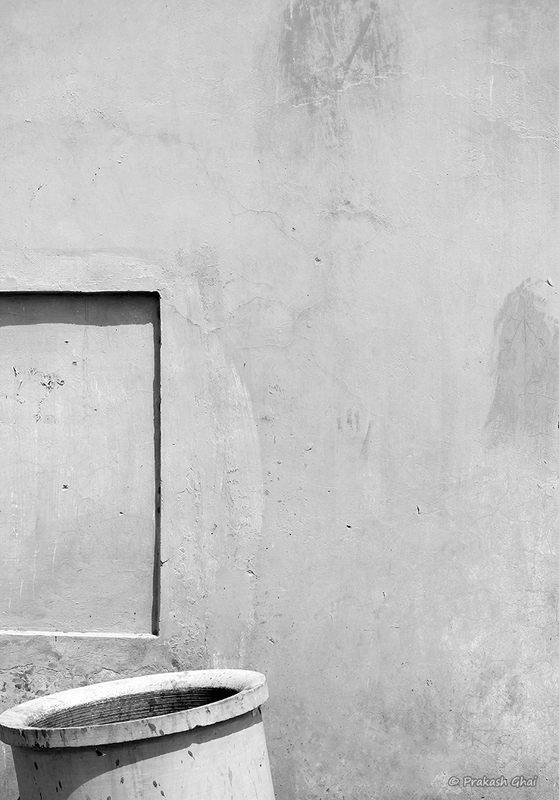 The Black Square depicts a struggler whereas, the White Rectangle depicts the life of someone with "Good Fortune"
The photo falls under Parts of the Whole category of Minimalism, as it contains a clipped (or part) version of two walls. The other day I was talking to my friend Vera Nikumaa from Sweden, whose father had died very recently at the age of 93. She told me that she was very proud that her dad lived for so long. When he was about 70 years old he told her that he wanted to live forever. Vera is an optimist and she keeps giving me motivating lectures whenever I am down and out. I showed her this photo, which I usually do to ask her if she likes the editing or not and her response was that this photo is somehow the one which she would like to use in her fathers death announcement. But she could not explain why it was the right photo. I stopped for a while and tried to interpret her sub-conscious mind. The extremely long shadow of the water outlet almost touching the base of the frame could have been interpreted by her mind as the wonderful 93 years or Almost 100 years that her father had lived. When I told her about my interpretation she was in agreement instantly and later expressed a desire to buy the photograph. I sell my photos through my Fineartamerica Profile. Whenever I upload my photos there or to Blogger, Titling the photo is not that easy but I was sure of this one, and it had to be "Almost 100". I chose to shoot from the side. That way I was able to capture and show the entire long shadow of the water outlet and even make it appear a hint longer. I cropped the photo from both ends, to make the photo appear even more Minimalistic. I call these Surreal Lines as in reality, they do not exist. They are formed by the game of light and shadows, that nature plays and I love capturing it. 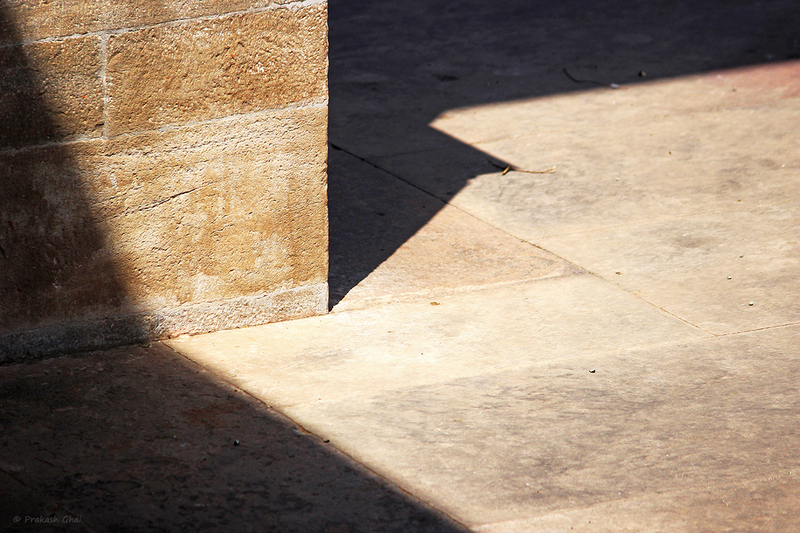 I was at the "Albert Hall Museum Jaipur" and when I spotted these lines playing Hide and Seek, I zoomed in all the way to capture this intriguing Minimalist Photo. As a thumb-rule make all vertical lines in a composition appear 90 degrees or as close as possible to 90 degrees. Also note that any horizontal lines may or maybe not be 180 degrees. These rules you would not find anywhere but here. They just make Minimalist Photos appear attractive. 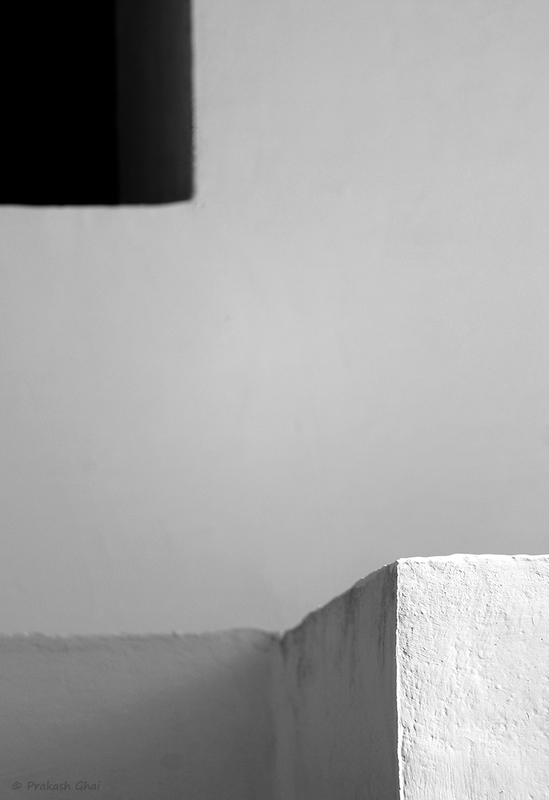 I chose to classify this image under Minimalism as Less Elements because there is only one element here which acts as the primary and lone subject i.e the Various Lines. I was on my way to Vailshali Nagar on my scooter. I approached a red light and I was waiting for it to turn green. 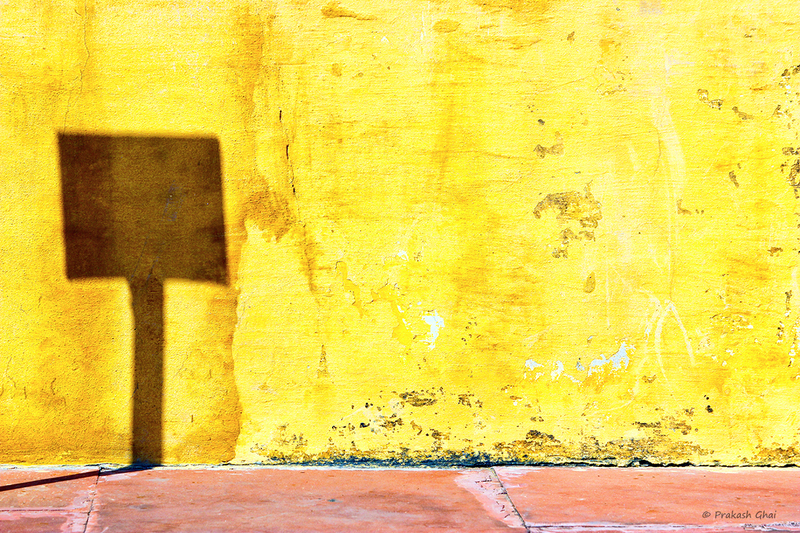 I quickly glanced in my rear view mirror to check for the traffic behind, but when I turned my head a little more to my right I saw this beautiful large yellow wall and some shadows falling on it. I decided to take a U-Turn to stop by the wall. My subject here is an electricity meter that keeps track of the number of units consumed. I loved its elongated shadow which is almost three times the actual size. I dedicate this image to my country India. We have a huge Power Shortage in our country and maybe we need three times the current power output as the image suggests with the elongated shadows. Our newly elected Prime Minister Shri Narendra Modi has promised to our nation that very soon the power crisis will be solved and we will get 24x7 electricity throughout the nation. To Compose, I placed the subject on extreme top left knowing, that if someday I decided to print it, it will be troublesome as I have not left any margin on the top left corner. Well, the only way out to manage the print could be frame-less framing. OK, Lets get back to the point. When you have elongated shadows to deal with, the best way out is to treat them as negative space and not as a supporting subject, and let them fall wherever within the frame. Of course make slight adjustments. But, remember your subject is the Power Meter and not the Long Shadows. Shooting corners is always interesting. As you can see above, we have Simplicity at its very best. It is such a simple photo that one would think that its extremely easy to click. That's wrong, the simpler a photo looks the harder it is to click. You need eagle eyes to spot such frames and once you spot it then all is easy but spotting such frames comes with a lot of practice. To Train yourself, you need to leave your camera at home and then go out and try to compose as many frames as you can with your eyes. I do this quite often and it definitely helps. 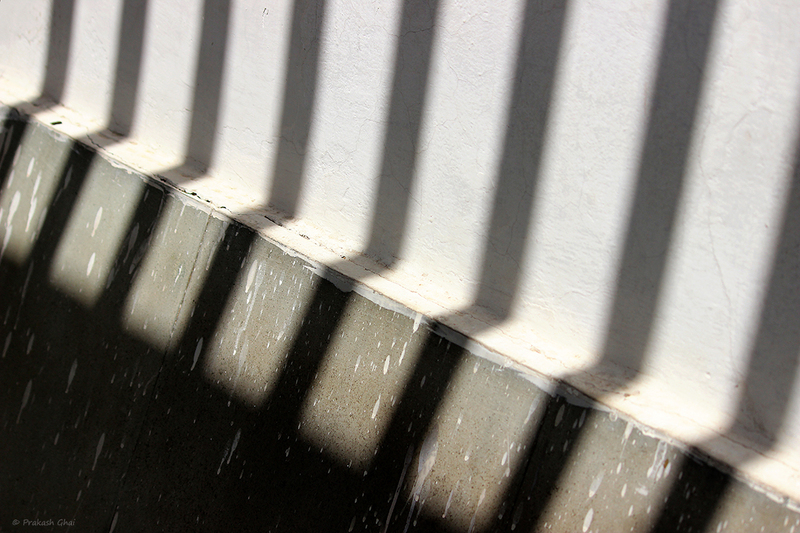 Here, I have used the blue sky for negative space and that subtle light and shadow play makes the corner stand out. Negative Space Minimalist Photos are perfect example of the Minimalist Photography Type: Minimalism as Less Elements. I was hunting for some architectural Minimalist shots at Swej Farm Jaipur, which is host to lots of new multi-story ultra modern apartments. I took a few shots and and the light was fading away fast as it was breezy and cloudy. In a few minutes there was a big dust-storm. I ran across the street to find myself a place away from all the dust. While I was waiting for the storm to pass by, I spotted this yellow cloth roof that belonged to a local Tea Kiosk to my left. 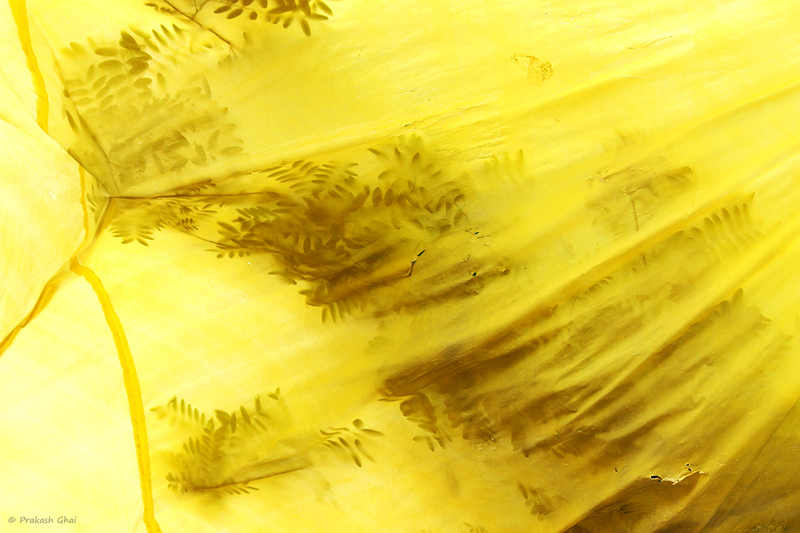 Yellow is a striking color and I never miss spotting it. It was very windy and therefore the tree leaves were pushing back and forth against it. I switched my camera settings from one shot to the continuous mode and pressed the shutter button. One out of the three shots that I took, was precisely what I wanted. Since the leaves were continuously moving back and forth, and therefore appearing and disappearing as very short intervals, I titled this post Hide and Seek. Hope that you enjoyed the shot and the behind the scenes action. If you do have similar shots, please post a link to them in the comments. Thank you. Sometimes, when we visit a local tourist spot in the city we think that we know more about that place than even the tourist guide. We overhear him while he is briefing his clients about the place and we try to confirm our knowledge with that. But very soon we realize, that he knows more that us, as this is his profession. This is the shadow of a "Hire a tourist guide" Sign Board, at Jantar Mantar Jaipur. I have clicked a square being formed by it. But the question remains, to Hire or not to hire a tourist guide? cant we just let go of our ego and learn more about our own city?. I placed the "Shadow Square" on the left, leaving a lot negative space in the frame. Minimalism using negative space is the Bread & Butter shot of Minimalism as Less Elements category. Placing the ground on the bottom was a little tricky and I made sure that I only included it to show the contrast in colors. 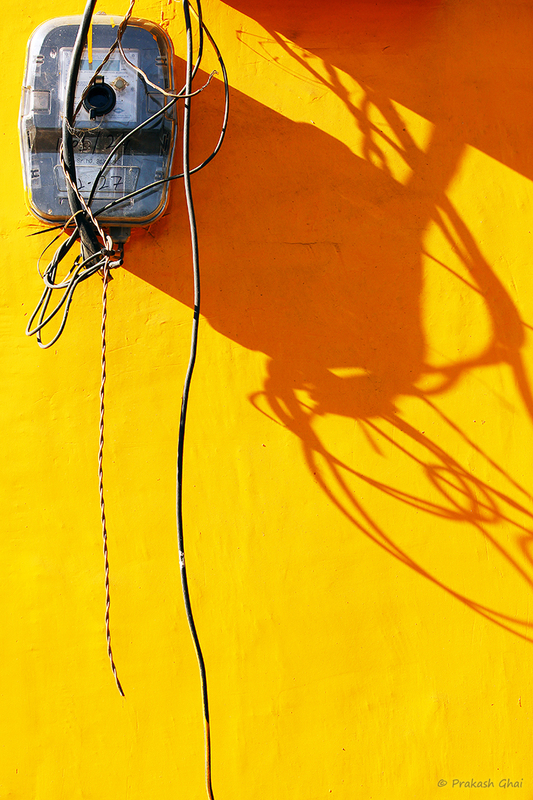 The strong texture of the yellow wall adds an artistic feel to the image. Most of us know about our weaknesses i.e Loose ends but do we really work on improving upon them. No, we don't and later blame the wrongs that happen to us either on other people or the circumstances. The rope above precisely depicts this scenario and because of our laziness the circumstances get even worse (harsh sunlight). To shoot, you have to find a neighbor who doesn't really care about her clothesline being broken. Go out in the Sun and forget about getting your skin color darker by a shade or two. 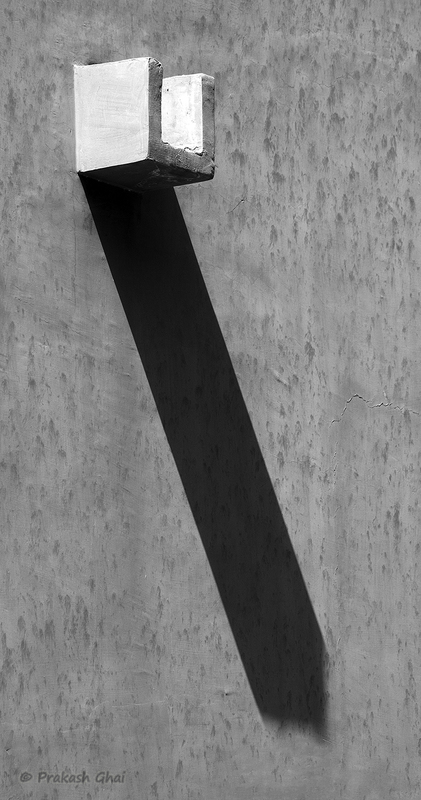 Light and shadow makes Minimalist Art stand out. Just place the subject as I did on top right, leave some place for the shadow and its done. I went to the Diggi Malpura Fair with few of my friends. This, was the entrance gate for the Dainik Bhaskar exhibition held right next to the religious temple. We went in all excited and were expecting some great food and beverages, but we forgot to take a clue from the entrance gate. The Entrace Gate was full of rust. 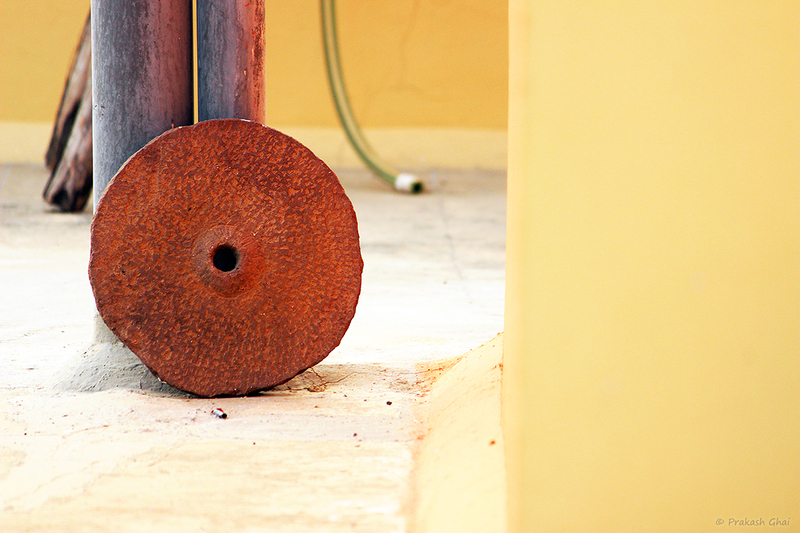 Rust also means unkempt, deserted and that too was the case with the exhibition. Only a handful of people inside, nothing to eat, very messy and not even water to drink. The learning that we got that day was that Entrance Gates also tell a lot about people around and how well taken care of the place could be. To take this shot I moved a little to the left of the rusty gate. Some empty space has been left both on the top and on the right of the frame. That is the only way I could ad negative space here since I needed a close shot of the gate to show rust and yet keep the frame Minimalistic. Therefore I ended up in a way using, double rule of thirds but in reverse. In reverse, as instead of the Negative Space taking up 2/3rd of the space in the frame, the subject took it. 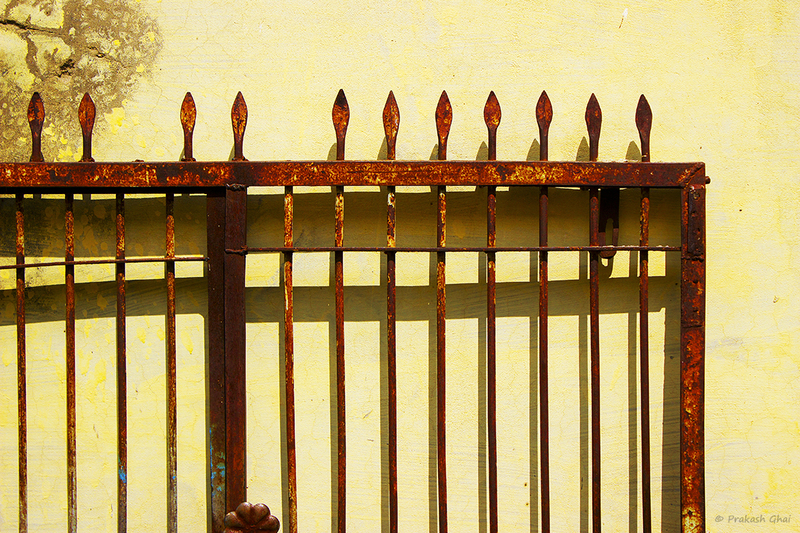 This shot had everything I could ask for, the primitive spade design, repetition, harsh sunlight, yellow wall and to top it all RUST. Hope you enjoyed the shot. Stay tuned. More Minimalistic Photos to follow. Me and my friend decided to meet for a street photography walk on a Sunday evening at about 6.30 pm. It was 3 pm afternoon when I had called him up and fixed the walk and I had the urge to go out in the sun and shoot minimal. I mostly go alone for Minimal photo-walks are there aren't any Minimalists in my city and I have not heard of even one or two of them from my Country. OK, so I went to this temple in Vaishali Nagar, the Akshardham temple and I was telling myself, I have surely lost my mind to be even thinking of shooting Minimal here. I roamed around for about 45 minutes but could not find anything. I knew my Sunday was wasted and I started to plan my next Sundays walk. While I was heading back from the temple I saw a man talking on his cellphone sitting right under this tree on the right. I decided that before leaving I should take at least one good shot, be it a street shot. I kept that person on the extreme right and was composing a horizontal shot (not a vertical one), the tree you see was to be kept out of focus and I had planned to place it on top left. But, something stopped me from clicking that shot. I felt as if the Tree was calling me, trying to communicate with me, as If there was a message, I was instantly hypnotized. I kept admiring the tree for about 5 minutes. I was spell-bound and and I felt something entered my sub-conscious mind. Maybe the message was communicated already and maybe I have been assigned the task to spread that message through this photo. Once It was clear why it was important for me to click this, the next challenge was to compose. 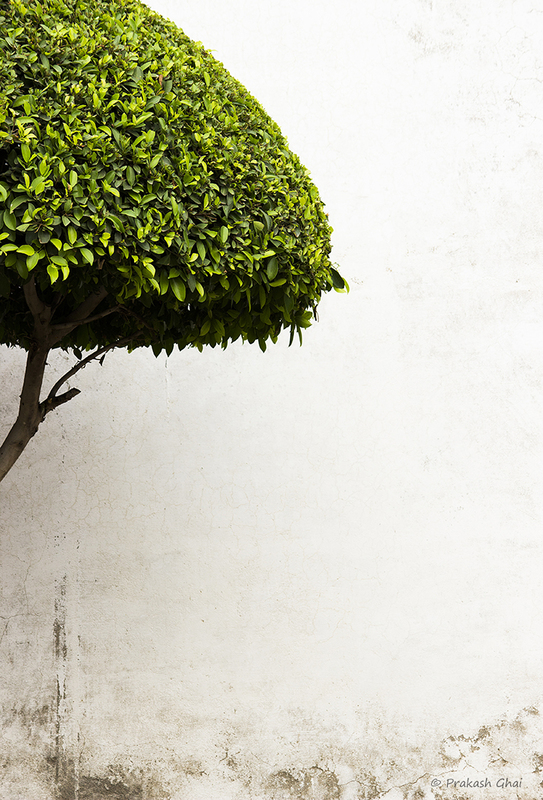 A minimalist shot with a Tree as a subject is actually quite tough, "Parts of the Whole Minimalism" was the answer. I decided to shoot vertical to avoid the man and placed only a part of the Tree on top left so that the mystery about the tree and the message remains. When Even circles are non-perfect, how can one expect life to be flawless? All that I want to say is, that it is a futile exercise trying to make or even dream of a Perfect Life. Life is messy and you cannot change that. "No you can't". All that you can do to live peacefully and accept what comes your way without asking any questions. To compose. I placed the circle on the left and used the edge of the building on the right to create a vertical rectangle. This helped me to show juxtaposition between two simple geometric forms. and because of the Simple Geometric shapes and the use of Less Elements, this photo falls under the Minimalism as Simple Geometry category. This photo give us another reason to have a good zoom lens in our camera kit. Such photos cannot be clicked with most short range prime lenses or wide angle lenses or with even the basic kit lens 18-55 mm that comes with the camera. The major drawback with zoom lenses is the drop in quality as you zoom. Therefore, you need to be very good at editing. I use about 3-4 editing softwares to edit my photos and it took me a good year to learn them. Alternatively, you can also buy those ultra expensive high quality zoom lenses like the 70-200 mm, if they fit your budget. Ok, Lets get beck to the photo. 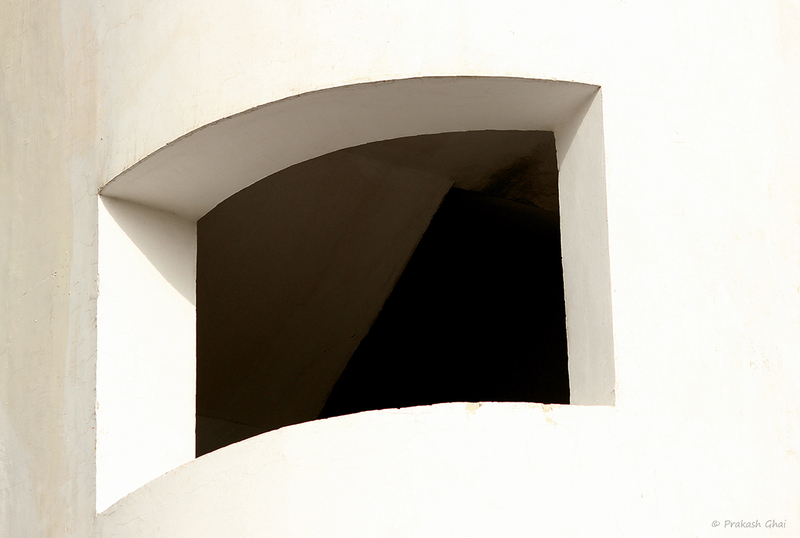 I spotted this window to right, near the roof of a design institute located in Vaishali Nagar - Jaipur. The sharp edgy curves and the near perfect finish really impressed me. Curves are always beautiful to look at and I am sure we all agree on that. I zoomed in on my Canon 55-250 mm lens, all the way close to the 250 mm range. This helped me to do away with the unwanted elements and shift and focus attention to just the geometric curvy window. 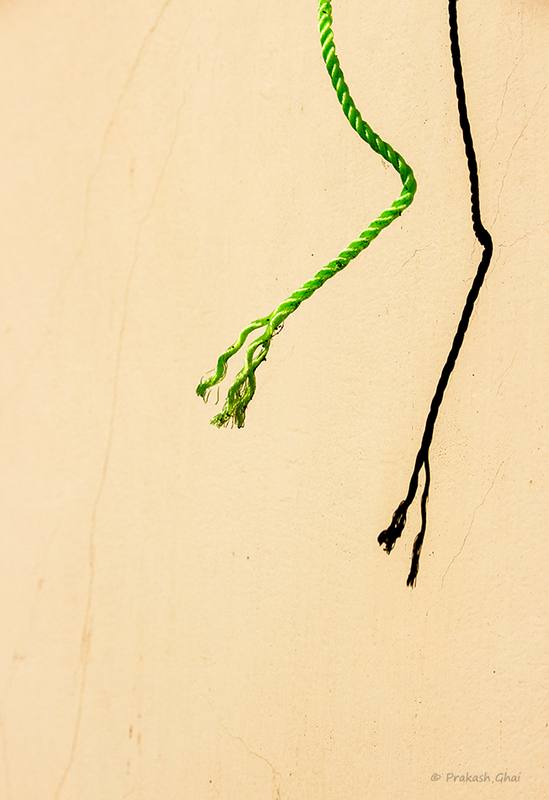 Therefore, the photo has been categorized under the Minimalism Category: Minimalism as Less Elements. It was very tempting to place the window in the center, but I placed it slightly to the left, we all know that most centered photos loose a lot of their appeal and feel. This is an area not many locals or even tourists know. It is right behind the famous Amber Fort in Jaipur. I was there with a friend of mine on a Sunday afternoon for a causal photo-walk, instead we met for a discussion over a cup of tea, the walk was just an excuse. 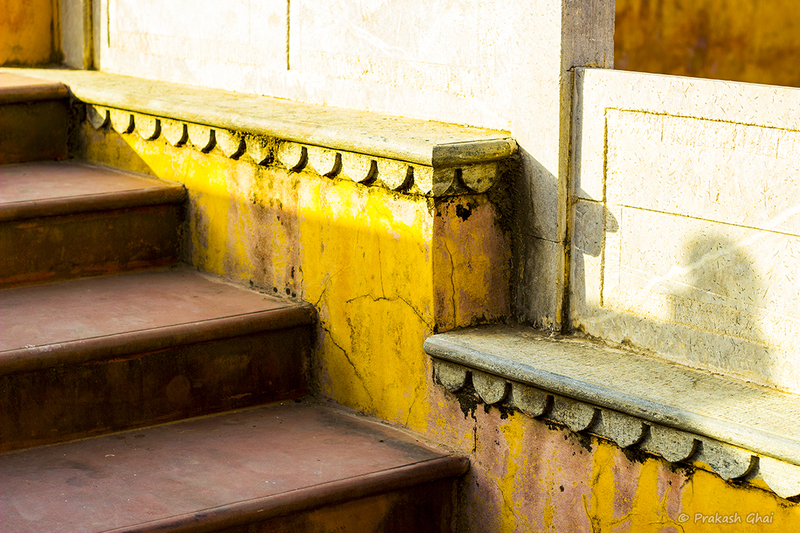 These steps lead to a famous Step Well called as the Panna Meena Ka Kund. I call them divine as they lead to a source of water and water sustains life. 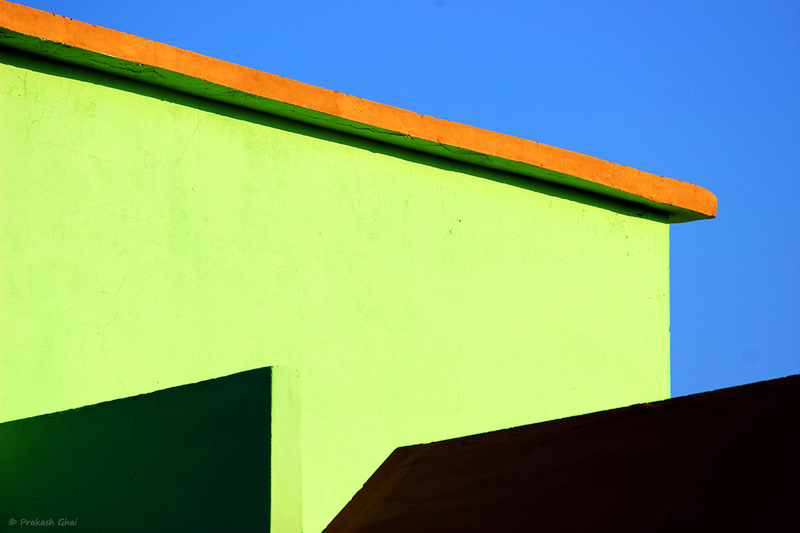 The photo falls under Minimalism as Simple Geometry category of Minimalist Photography. I used the lines of the steps coming in diagonally from the left. This created a sense of depth in the photo. The sunlight on the upper half of the frame resulted in a gradient sort of effect. Today, I was sitting with my nephew and he asked me to show him some of my photos. He knows how much I am into photography. I took out my cellphone and showed him some of my works that I had posted on Instagram. My Instagram Id is @prakashghai. I showed him a photo which had both a square and a triangle in it. He was very excited and there was an instantaneous smile on his face. The reason for the big smile was that, he was studying those shapes at school. I never knew that Minimalist photography would bring me "Back to School", back to the basic geometric shapes that I learned in childhood. I cut the rectangular shape on the right into a square, by moving to my left and by placing it in the top right corner. I made sure that I included another geometric shape i.e the long rectangle below, as a supporting element, to make this photo fall comfortably under the Minimalism Category: Minimalism as Simple Geometry. This curved metal hook belongs to a cargo truck. Sometimes randomness hands over a subject to you out of nowhere. I was wondering what to click on the streets of Vaishali Nagar where I thought I would be able to find some interesting Minimal Shots, but the lane that I took was probably the wrong one. On my left I only had one large red colored wall about 100 meters long with nothing on it. I soon got tired and waited at a local Pan Shop. It was very hot and I was lucky to find a cold drink there. While I was refreshing myself with that cold sweet carbonated water, suddenly a cargo truck came and stopped right in front of me (randomness at play) to deliver goods to a nearby shop. 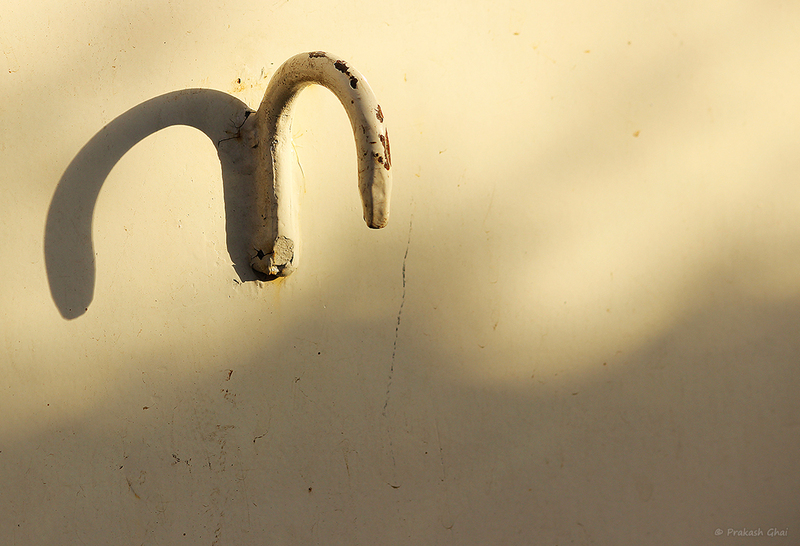 I immediately spotted this beautiful curvy hook with the shadow. The photo falls under the Minimalist Photography Category: Minimalism as Less Elements. I placed them on top left to apply the rule of thirds. Some of you may argue that the shadow and the hook are not of exact similar size, I measured it from the side and they are equal although it doesn't look so from the front. This shot is from my garden. I spotted this as a curve to begin with. Curves are usually associated with women. And some of them are just as tender and fragile like the plant shown in the photo. 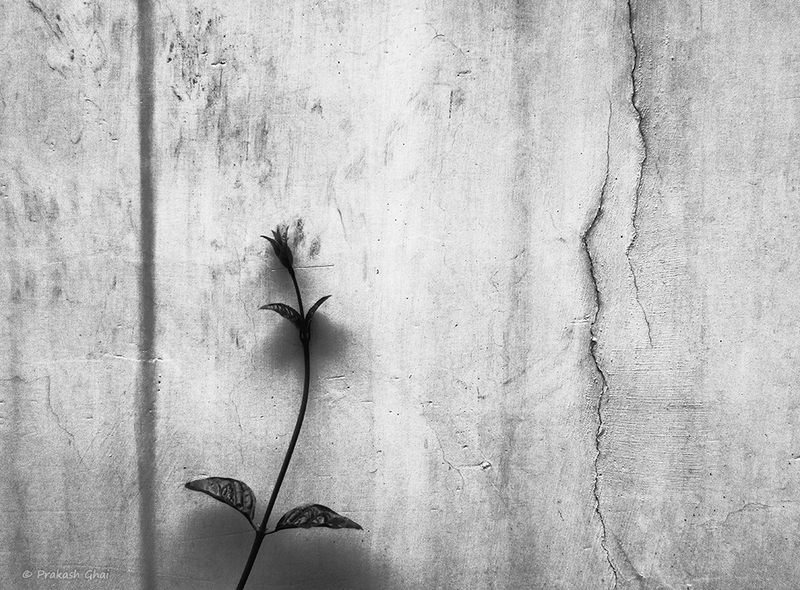 When I observed carefully, I noticed how the plant was leaning against the wall, taking support from it. That gave me the title and story i.e "Forgotten Love". This is a story of a tender, fragile, feminine, loyal woman, who loved with all purity. But, she did not have luck by her side. He broke her heart and her world got stripped of all joys and color(hence, black and white). The heartbreak made her so weak that she couldn't even take care of herself. Therefore, she is now taking support of her friends (or the wall), represented by the plant leaning on it. This is Minimalism as Less Elements. The curved plant is the lone subject here and empty walls have been used to create negative space. The cracks on the right, adds to the drama and the monochrome nature of the photo, intensifies it. My friends were sitting at Indian Coffee house at Jawahar Kala Kendra and I was supposed to join them for a cup of coffee and some afternoon snacks. It was about 4 pm. While I was on my way I found this fantastic play of light and shadows on my right. I took about 15-20 shots and by the time I joined my friends my cup of coffee had gone cold. I would never sacrifice my coffee or the green teas that I like for anything but for Minimalist Photography. Now lets go back to the Minimalist Composition. To frame this, I moved very close to the subject i.e the wall and took this photo from the side so that I had two diagonal lines running from left to right cutting right across the lines in repetition. The lines created by the shadows are eight in number total and I added to two diagonal lines to it i.e 8+2=10 and therefore I titled the post "Ten Lines". Just like us friends, had at nice discussion over coffee that afternoon, these Ten lines too had something to argue about. One big curve formed by the Over-bridge, Street Lights in repetition and Two Wires running across the frame. The Minimalist Composition looks tough, isn't it? Yes and No. This was full of clutter in color, but after turning the photo into black and white it looked fairly simple. Therefore, when your photos look cluttered in color, try turning them to black and white. This does away with a lot of distraction and makes the look simpler. I started by aligning the big Over-bridge Curve first and then I let the "Street Lamps in Repetition", just fall in place. I made sure that the lamps were 90 degrees upright. The two wires running across the frame adds to the Minimalist Aesthetics beautifully. 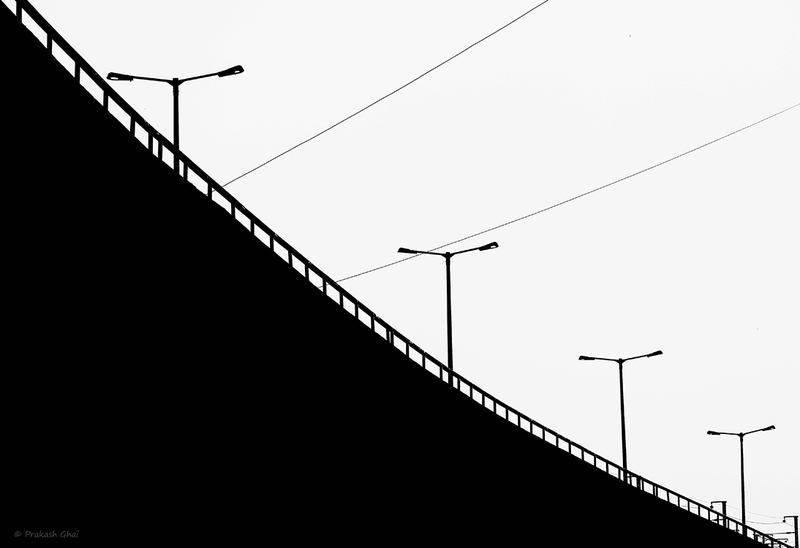 The photo falls under the Minimalism Category: Minimalism as in Repeating Shapes i.e the Four Street Lamps. 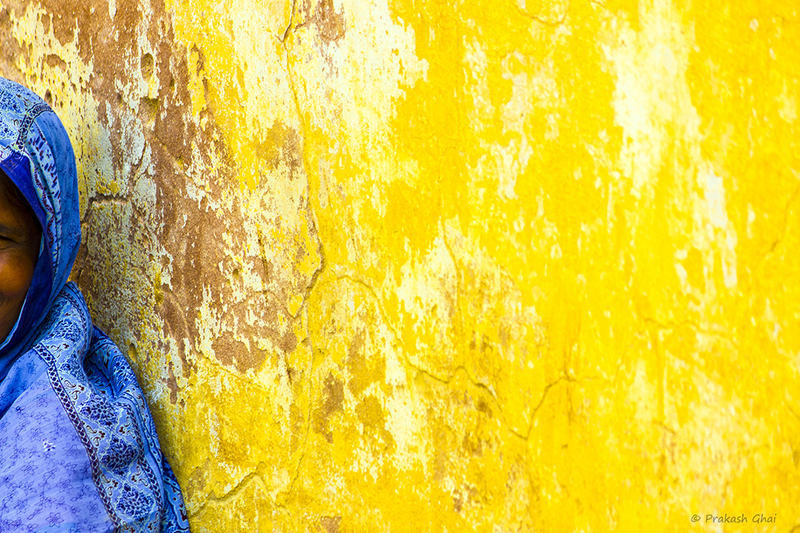 ...in a striking "Blue Saree"
I loved the contrast of yellow and blue so I decided to make a Minimalist Shot of it. At first I was confused as I had never shot a Minimal before using such a large image of a person, rather I generally shoot objects. This is where the domain knowledge of Minimalism helped me. I quickly realized I could click only a part of the woman, thereby eliminating the human structure and fit it under the Minimalism as parts of the whole category of Minimalism Photography. Composition was tricky to begin with but once I knew that I only have to clip the woman, I got it right in three shots.